Some of the most difficult decisions in our life can be focused so outwardly, that it’s hard to see the ground beneath our feet, where we stand in this moment. We may feel uncomfortable, experiencing deep ache, moanful longings, with night bringing far away places into our dreams, as desires emerge to tell us of the many secrets within the heart. 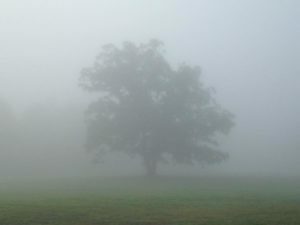 Soon enough, foggy mornings return us back to this body, and in awakening awareness, we contemplate the many wonders of imagination that have stirred our emotions. So we listen, allowing ourselves to abide in the strong energies, holding our heart, as we observe the many choices that come to and fro in our mind, taunting us at the multitude of paths that lay before us, while we flounder in the dross of our seeming stagnation. Even in the recesses of the mire, somewhere deep within us, that part calls to us, asking to step forward, peering over high walls, to the outer circumstances that beset us, waiting for the perfect timing of a painful birth. And as today unfolds, we ask ourselves if we are ready, if our heart has been loved, if we realize there really are no wrong choices, as reflection reaches out her hand of providence to present us ever opening desires. For it is in these uncertain places that we shall find our most stable footing – in the darkness, that we shall truly come to know our light, as we explore where we feel lost, alone, and unsure. Previous PostPrevious ITS HERE! “DEEPLY ROOTED IN LOVE: A MEDITATION JOURNAL FOR THE HEART” REVISED EDITION IS NOW AVAILABLE ON AMAZON!